Join in the fun on LC Day on Wednesday, April 17 as we celebrate all the things that make LC great — the myriad classes and extracurricular events that the LC community enjoys in a typical 24-hour period — and our great people, including our alumni. Let us know what is happening during your day, no matter where you are. We want students, alumni, faculty, staff, and friends to post photos and videos on our Facebook page. 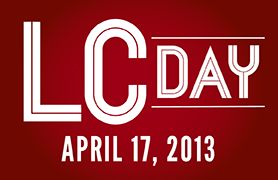 If you Tweet, use the hashtag: #LCDay or check out our Tweets. And, we’ll be posting to our Pinterest account. Visit www.lynchburg.edu/lcday/ throughout the day.